Ménerbes, France, is one of the best known of the Luberon villages and rightly so. It's not only beautiful in itself, but the surrounding countryside is beautiful as well. If you are making a tour of Provence, consider adding in a trip to Ménerbes. Ménerbes is located about seven miles east of the larger city of Cavaillon between Oppède (you'll want to visit old Oppède, Oppè de-le-Vieux as well) and Lacoste, which is known for its castle once owned by the Marquis de Sade. Ménerbes is once of France's prized "perched villages" or villages-perchés; the village is spread out on the top of a hill that rises from a valley of agricultural fields, vineyards (from which the celebrated Côtes du Luberon is produced), and cherry orchards. In the spring it's gorgeous, and in the fall, it is still quite colorful. At one end of the village is Ménerbes' 16th-century castle. In the center of town is the Place de la Mairie, surrounded by 16th- and 17th-century buildings—and a little further on is the ​Place de l'Horloge, where you'll find a wine, truffle, and olive oil education facility called ​Maison de la Truffe et du Vin du Luberon. In the summer, there's a small cafe/restaurant where you can taste these items. Between Christmas and New Year's it hosts a truffle fair. While the village of Ménerbes might not suit the long-term visitor, the villages surrounding it can't easily be covered in a week. You might want to stay at a place in the Luberon and take day trips—the distances to each attraction from another aren't large, and the countryside is beautiful enough to keep the tourist from becoming bored with the landscape. Ménerbes makes a good hub from which to operate this way. Ménerbes isn't awash in hotels. Suffice it to say there are more bed and breakfast operations around Ménerbes than hotels. A place with a spa—such as the Hostellerie Le Roy Soleil—might fit the bill. Or, a little further out, La Bastide de Soubeyras is also one of those charming old farmhouses with apartments. The good deli food available in the Luberon may make you wish you had a self-catering apartment, even if you don't like to cook on your vacation. Some describe Ménerbes being inside the "Golden Triangle" of the Luberon. 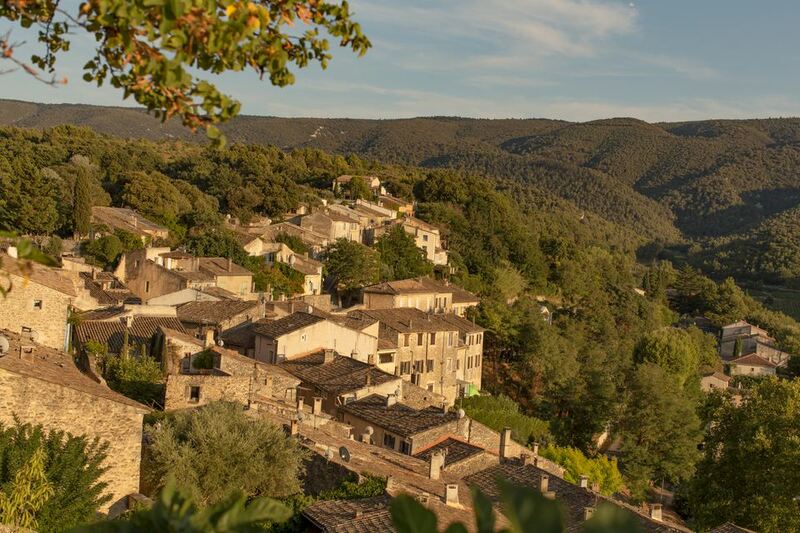 The main villages include Ménerbes,​ Gordes, Lacoste, Bonnieux, Apt, Roussillon, and L'Isle-sur-la-​S​orgue. Just outside of Ménerbes is the ​Abbaye de Saint-Hilaire founded in 1250 and easily spotted from the ramparts of Ménerbes. If you've ever wanted to see a collection of 1,000 corkscrews, nearby is the Musée du Tire-Bouchon (Corkscrew Museum). Did Peter Mayle Ruin Menerbes? At one time there was a lot of talk about the success of Peter Mayle and how that success translated into the over-touristing of the little village of Ménerbes. However, Ménerbes seems to have reverted to the pristine and sleepy little village it was before Mayle arrived. So, don't hesitate to visit this Luberon landmark.